This recipe will show you how to cook steak using your microwave. I know some of you reading this are thinking “But why? But how? Is it even possible? Well, yes it is possible and there are some pretty good reasons to microwave cook your steak so read on. Many people like their steak medium-well-done or well-done. This means it that it is cooked all the way through with a pinkish to grey-brown colour in the middle. It’s middle should not be red or bright pink or secreting red juices as would a medium to rare steak. The other feature of a well done steak is that to get it cooked all the way through, the outside of it often gets charred. If that’s how you want your steak then fine, cook it in the pan. However, if you want your steak well done, without the charring, then cooking steak in the microwave the perfect method. When you microwave steak, you are benefiting from the fact that the microwaves will cook through down to 1.5 cm into the steak. This means that microwave steak gets cooked evenly all the way through to the middle giving it a degree well-done-ness (if that’s a word) with no charring. This microwave steak recipe will need a tiny bit of help from your trusty old frying pan to finish it nicely. A Maillard Reaction (browning) just ain’t gonna happen to your steak using the microwave alone. 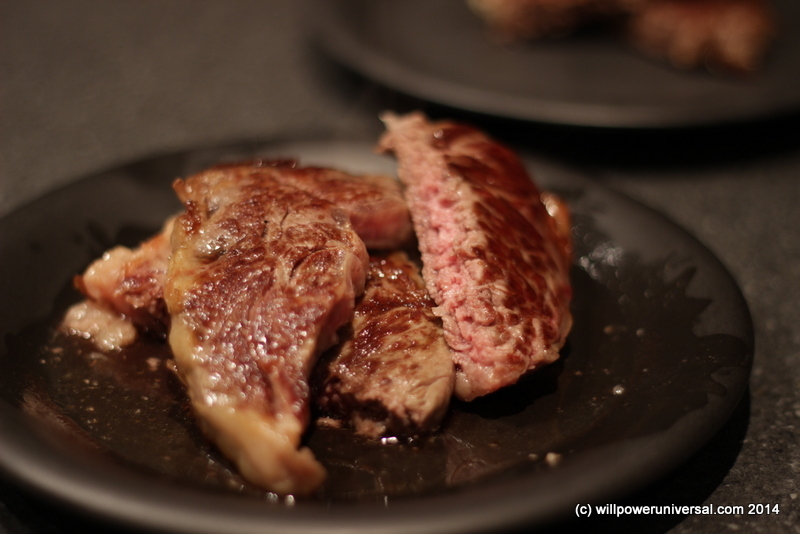 For this recipe I wanted to compare a microwave steak with a non microwave steak so I bought two nice cuts of aged British sirloin steak from the meat counter at the supermarket. I cooked one steak in the microwave and the other in the pan. I took some pictures so you can see the difference but you’ll have to trust me on the tasting part because I cannot share that experience with you via the Internet just yet. You’ve waited long enough so here’s how to microwave a steak. 250 g steak. The one I used was a 2 cm thick sirloin cut. Turn the steak over and again at half power, cook for another 1 -2 minutes depending on how well you want your microwave steak done. Heat up the oil in the pan at a high temperature and sear the microwave steak for around 30 seconds to 1 minute on each side depending on how browned you like it. Remove the microwave steak from the pan and allow to sit for a couple of minutes. Steaks are commonly eaten with potato based foods like chips, french fries or mashed potato. Some other suggestions of foods to accompany your microwave steak include fried eggs, salad or roasted vegetables. Most importantly a good red wine is required to fully bring out the flavours of your microwave steak. If you buy a good quality cut your microwave steak will not need any salt, pepper or any type of seasoning whatsoever. Simply cook it and enjoy the natural flavour. If you like you like your microwave steak nice and juicy eat it as soon as you remove it from the pan and let the juices run out when you cut into it.. If you prefer your microwave steak a little firmer then give it a couple more minutes before tucking in. 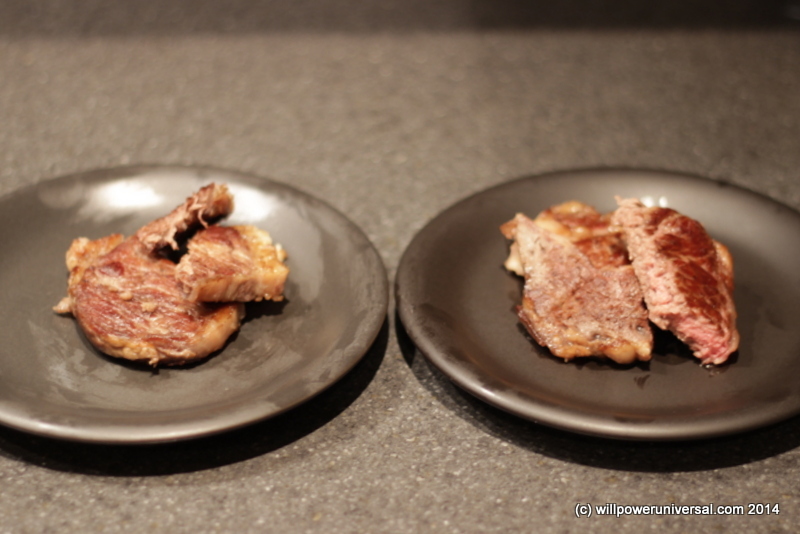 Here are some pictures showing the pan assisted, microwave steak alongside the fully pan fried, non microwave steak. The non-microwave steak is a little pinker in the middle as expected and a whole lot greasier. The microwave steak was more well done but still retained it flavour and was tender to the bite. The verdict... microwave steak wins if you want the meat well done right through, without charring the surface. If you like it pink then just use the pan alone. Argentina is the 5th largest wine producer in the world and her most famous wine is Malbec. Argentine Malbec wine is characterized by its dark red color and its velvety, intense fruity flavors. Malbec is the perfect accompaniment for your microwave steak or any good steak for that matter. I don’t like to cook. Make that, I hate cooking. Unfortunately, I have become tired of my usual TV diners. Even pizza has become a bore. What to do? I decided on a bold move. I decided to stock up on steaks. I did so, but the next problem was in their cooking. The butcher was shocked when I mentioned using my microwave, but I persevered. I have a 500-page book on microwave cookery. I have had the book for several years, but I’ve never looked in it. Yesterday I did. Now was my turn to be shocked. Not a word on steaks or many other of the things that I’m interested in. Well, the internet usually has an answer for everything, and that’s how I ended up here. 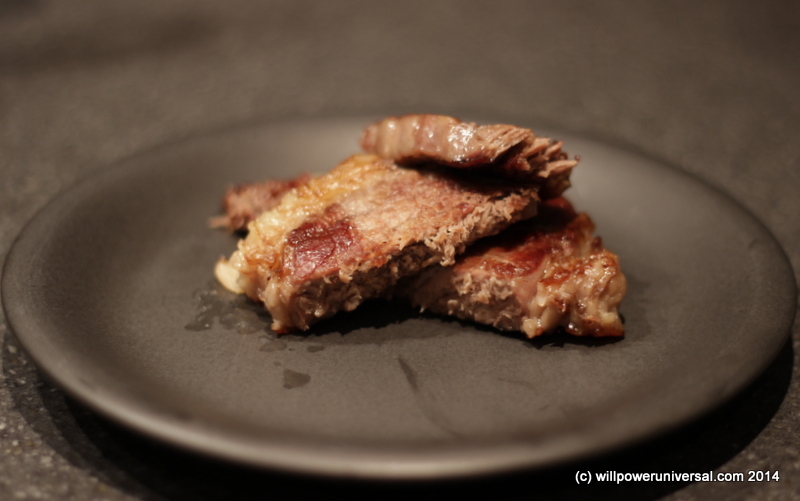 You gave me courage to do the unthinkable: microwave a steak. I am now chewing on the results of my first trial. The steak is fine, but some might think it too well done. Anyway, here’s how I did it. First, I have to say that I found your way to be too complicated. I did away with the bowl, and I can’t be bothered with changing the setting on the microwave. However, I did place a paper towel under the meat, and that is a good idea (It helps to clean up the mess after the cooking). Anyway, I placed the meat on the paper, microwaved it on the usual high setting for 3-minutes and then turned it over and cooked for three more minutes. Next time I’m going to leave out the turning over, but I will reduce the total cooking time to five minutes. It’s now a matter of fine-tuning.Thanks for getting me off to a great start. You, sir, have attained the pinnacle of lazy cooking. The effort put into finding the best way to be lazy makes you a true master in the arts.